You may remember that my personal challenge for this year is to visit 6 restaurants on the "Best New Restaurants in St. Louis" list and, on the months I don't visit a restaurant, attempt to recreate something off of the menu. We're calling it 2012 Eat and Repeat. I oohed and aahed over our January visit to Salt and had no idea which of the fabulous dishes we'd tried I'd end up recreating. Would it be the chocolate brulee? The butternut squash soup? The pig's tongue? Umm no, definitely not the pig's tongue. In the end, it was the bacon and egg risotto. I've had this dish twice at Salt now and each time was wowed by how such a simple dish could leave me with such a memory. 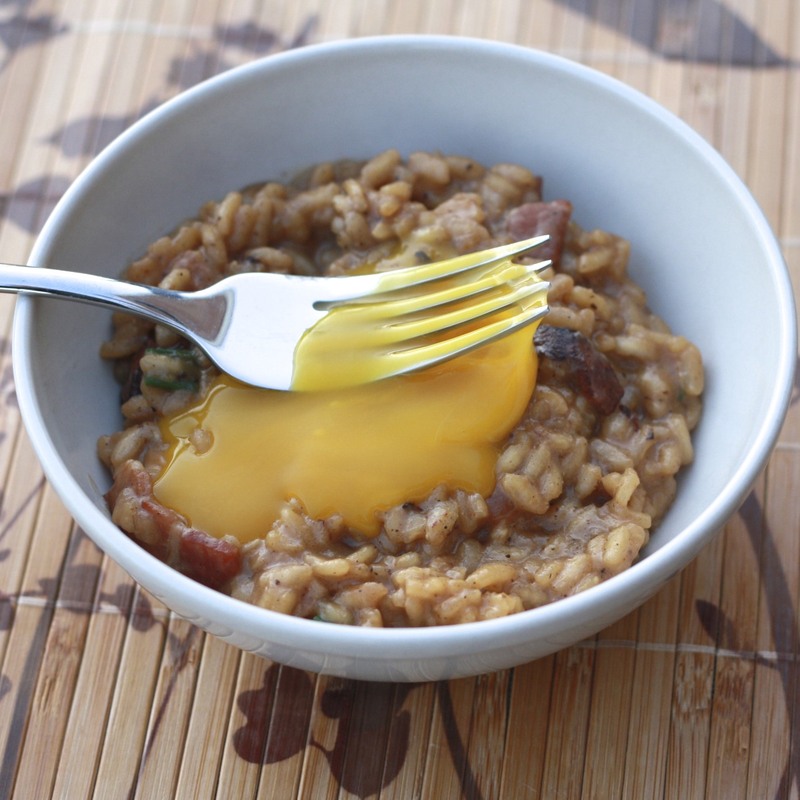 I blame it on the drippy egg yolk, which was the perfect dressing for the creamy risotto with specks of bacon. I used my basic skills about risotto making and checked out a few recipes online before coming up with this version. I have no insight into Salt's recipe, but this captured many of the same elements: cheesy risotto, salty bacon, and of course the drippy yolk! Mine looks a little reddish in the pictures, I think because I ran out of chicken broth and had to use some beef broth (use all chicken broth as listed in the recipe below). This is a heavy dish--if serving as a side, you can probably feed 4-6 mouths. As a main, more like 2-3, depending on how hungry you are. If you're worried about eating uncooked egg yolks, buy pasteurized eggs! 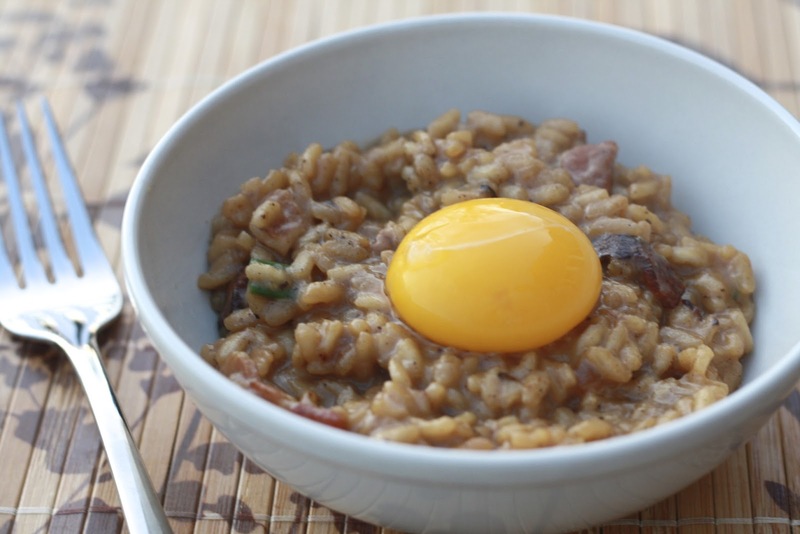 Looking for other risotto dishes? Try Spring Green Risotto or Creamy Vegetable & Edamame Risotto. 1. In a large saucepan, heat chicken broth until simmering. In a second saucepan, melt butter over medium heat. Add onion and cook until translucent (4-5 minutes). 2. Add diced bacon to the onion skillet and cook, stirring occasionally, until bacon is browned and beginning to crisp. Add garlic and rice and stir for a few minutes to toast the rice. 3. One half cup at a time, add the warmed chicken broth. Stir frequently (you don't need to stir continuously though) until each half cup of broth is absorbed. Repeat until all broth has been added to the risotto and it begins to thicken. 4. Stir in white wine, cheese, and green onions. Remove from heat and season with salt and pepper. 5. 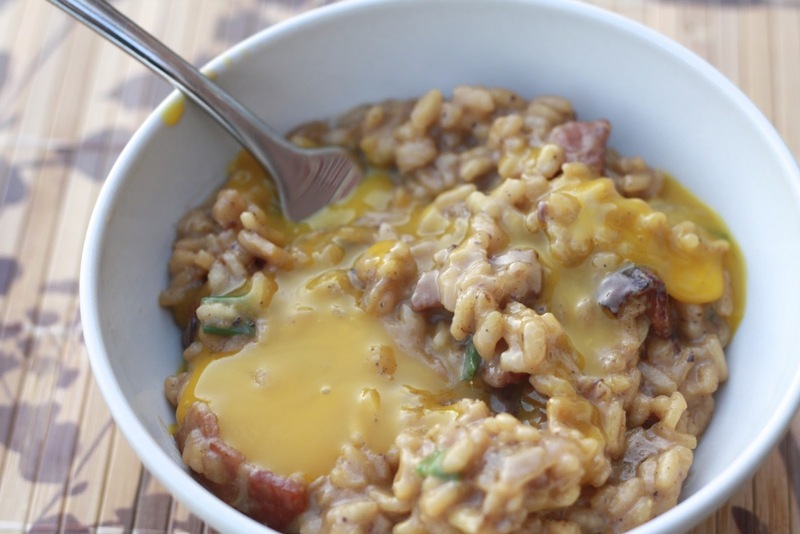 Immediately divide risotto amongst bowls and top with an egg yolk. 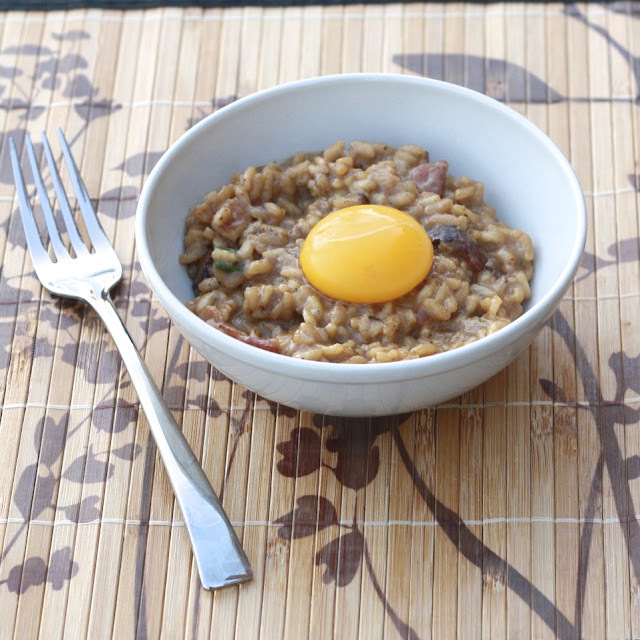 Carefully break the yolk and mix it in with the risotto.